When Claudia Salada opened her utility bill earlier this year, she went into sticker shock. Salada, an administrative assistant in Fremont, Calif., was accustomed to paying about $500 a month for gas and electricity for the three dwellings her family inhabited on a single lot. But her jaw dropped when she saw her July bill: $2,000. "I thought it was a mistake," says Salada. "Paying $2,000 for utilities is ridiculous, and I don't have that kind of money." Salada's big bill arrived a month or so after the local utility installed so-called smart meters on her property. These devices, millions of which have been deployed nationwide, wirelessly transmit information about household energy use to utilities. The system is designed to cut costs in two ways: it eliminates the need to send out meter readers, and it provides real-time consumption data, which enables utilities to charge lower rates during off-peak hours. The idea is to encourage consumers to change their energy-intensive ways; a decision as simple as when to run the dishwasher can have a significant effect on the bill. But the smart-meter rollout, which is being funded as part of a $3.4 billion upgrade of the nation's power grid, has been met with thousands of complaints from customers across the country for a variety of reasons. Class actions have been filed alleging overcharging. Tea Party members in Cleveland have decried the meters as a breach of privacy. Three communities in Maine passed resolutions asking the local utility to halt installations until residents can get more information about the potential health hazards of the radio waves emitted by the devices. The loudest protests are coming from California, where Pacific Gas & Electric (PG&E) has installed some 7 million smart meters. When the state's public-utilities commission recently voted down a request to stop deployment of smart meters, one opponent stood up and shouted at the commissioners, "How do you sleep at night?" In December, protesters blocked trucks from leaving a smart-meter installation yard and shut down a customer-service center for a few hours. Utilities have responded to the outcry by insisting that the meters are accurate. A recent analysis by an independent research firm concluded that the meters worked well and that the higher bills were the result of rate hikes, increased usage during extreme weather and, in some cases, smart meters' replacing malfunctioning units that had been undercharging customers. 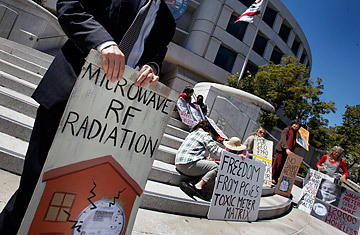 The companies also say that the smart meters comply with federal safety standards and that the amount of radiation they give off is comparable to what cell phones, microwave ovens and other common household devices emit. As installations continue, a spokesperson for PG&E says the utility is "evaluating options" for customers who say they don't want smart meters. That possibility comes too late for Salada, who complained to the public-utilities commission but was told that it could find no obvious error in her bill. "We eventually had to move because we couldn't pay the utility bills," she says. "Now I have a $9,000 bill on my credit report."